NASA's New Telescope: Threatened by the Budget? NASA's Final Shuttle: The End of an Error? So this is really, truly, definitely it. When the shuttle Atlantis rolled to a stop at the Kennedy Space Center at 5:56 a.m. on July 21, the 30-year space-shuttle program at last came to an official end. No more final-launch buildup, no more re-entry countdowns, no more elegies to the 135 missions flown by five ships. Does all that mean we can move on, wrap things up, hit the lights? Well, not quite: Never mind the question of if or when there will be another U.S. ship able to take astronauts into space; there's still the small matter of the International Space Station (ISS) we left in orbit. The massive structure is 357 ft. (109 m) long  or a football field, plus the end zones, plus 12 yards. It has a volume of 12,705 cubic ft. (360 cubic meters) and it's expected to remain in use for another decade. Oh, and then there's the matter of the six-person crew that's currently on board and would probably like a ride home eventually. Mothballing the shuttles was fine, but it's a little as if the U.S. had opened an orbital B&B and then junked the jitneys that were needed to get the vacationers back and forth. And with at least 10 more three-person crews queueing up to take their turns aboard the ISS in the next few years, those space buses will be sorely missed. The good news is, there's an unlimited number of Russian Soyuz spacecraft to fill the gap. The bad news is, well, there's an unlimited number of Russian Soyuz spacecraft to fill the gap. If the shuttles were business class and the old Apollos were coach, the Soyuz is a little like hiding in the wheel well for a coast-to-coast flight, even if it's a wheel well with an impeccable safety record  at least recently. The first Soyuz was launched on April 23, 1967, and carried cosmonaut Vladimir Komarov into space. The mission also ended on April 23, 1967, and so, sadly, did Komarov's life, after a series malfunctions occurred in orbit, leading to an emergency re-entry. The descent was comparatively routine, but the ship's parachutes never opened, causing the Soyuz to make what engineers call a ballistic re-entry, a return to earth that is every bit as deadly as it sounds. Things got better after that, and eight generations of Soyuz over the past four decades have made the craft the workhorse of the Soviet and now the Russian manned space programs. But a safe ride does not have to mean a comfortable ride, and Soyuz does not waste a lot of money on frills. The space shuttle can accommodate six astronauts and has a massive habitable volume of 2,500 cubic ft. (71.5 cubic meters). Soyuz holds three people in a 141-cubic-ft. (4 cubic meter) sphere. O.K., it's unfair to compare a reusable space plane with a throwaway pod, but even the old Apollos had about 210 cubic ft. (6 cubic meters) of elbow room. Astronauts riding a Soyuz sit with their knees drawn partway up to their chests and must remain more or less that way throughout the flight. "I'm not a big man, so I can fit well," says Japanese astronaut Koichi Wakata, who flew a Soyuz to the ISS once and will make a return trip in 2014. "At one point, we did climb back into the Soyuz and fly around the space station so we could park in a different docking port. It was a nice ride. It was a cozy place." Recent upgrades to the Soyuz have made it a little bit more comfortable even for people bigger than Wakata. The you-must-be-smaller-than-this-to-ride limit used to be 6 ft. and 187 lb. (183 cm, 85 kg). Redesigns have helped raise those cut-off points to 6 ft. 3 in. and 209 lb. (190 cm, 95 kg). 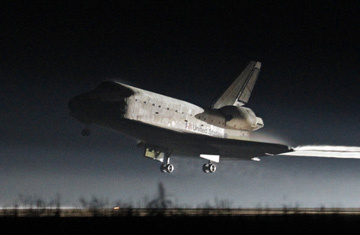 No matter the size of the folks on board, it's the re-entry rather than the launch that crew members accustomed to the glamour of the shuttle will notice most. An orbiting shuttle would fire up its engine, slow its speed and descend belly first through the atmosphere, landing on a runway like an airplane. The ride could be rugged, but the crew sat upright throughout. With the Soyuz, things are a little sportier. After the spacecraft decouples from the ISS, the commander fires the re-entry engines and then jettisons the docking module that's attached to one end of the crew compartment and the engine module that's connected to the other. The little pod that remains plunges into the atmosphere, encountering the first air resistance at about 400,000 ft., or 75 miles (122 km) up. It falls at a brisk 492 m.p.h. (792 km/h) until its small drogue parachutes pop out at about the cruising altitude of an airliner. The main parachute is deployed shortly after that, and at just 3 ft. (91 cm) above the surface, three small engines fire to brake the landing slightly. That landing, incidentally, is a thumpdown on the ground, not a splashdown in the ocean. And did we mention that through most of the re-entry, the spacecraft is spinning in order to maintain stability? So, you still want to be an astronaut when you grow up? The fact is, of course, that plenty of people still do, not to mention all the folks who have flown either the shuttle or the Soyuz before and can't wait to go back up. It's no secret that NASA's manned space program is a mess at the moment, with no definite deep-space destination and no agreed-upon ship to get us even to low-earth orbit. NASA is currently building the Orion crew vehicle  a kind of oversize Apollo, principally for the deep-space part of the exploration portfolio  and private companies like SpaceX, founded by PayPal inventor Elon Musk, are making an aggressive bid for the low-earth-orbit astronaut-shuttling business. If these ships actually make it off the production line and onto the pad, U.S. launches could once again become routine  and even comfy. Until then, buckle in: it's going to be a bumpy ride. See 50 space-race highs and lows.